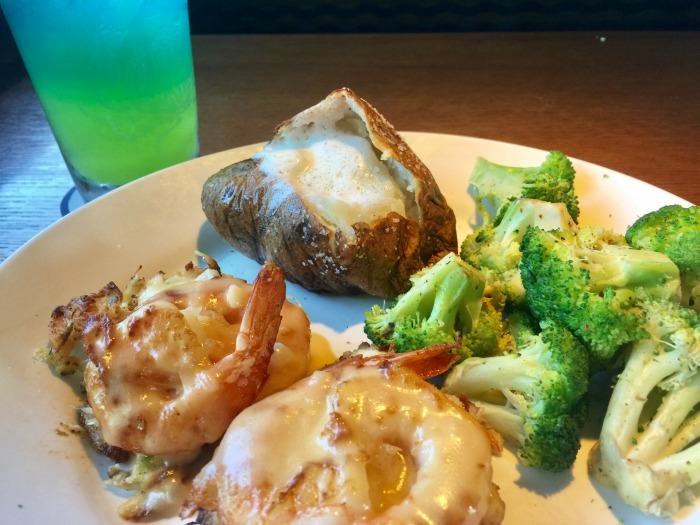 Red Lobster – Crabfest is Back and We’re Celebrating! 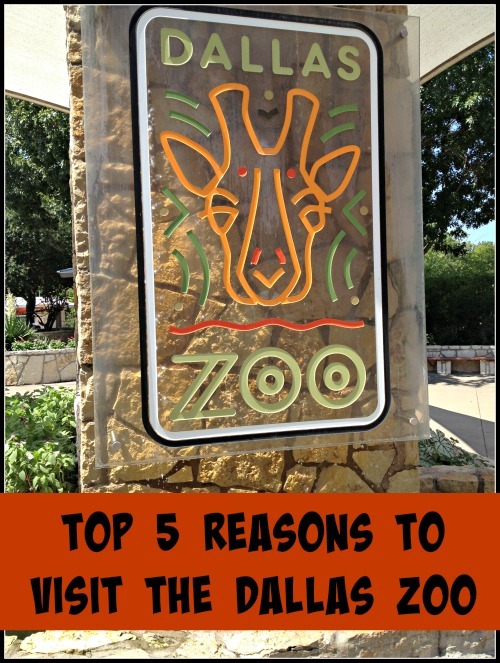 Do you have a favorite family restaurant? 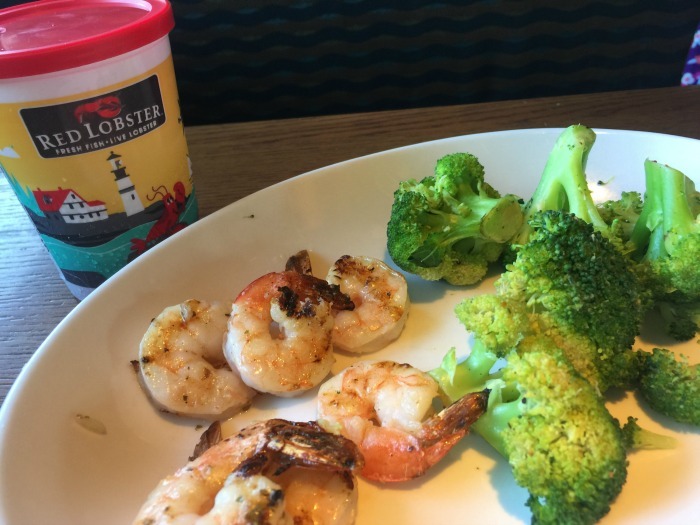 For my family, there’s one place we go to where everyone will be more than happy with the atmosphere and incredible food…Red Lobster. 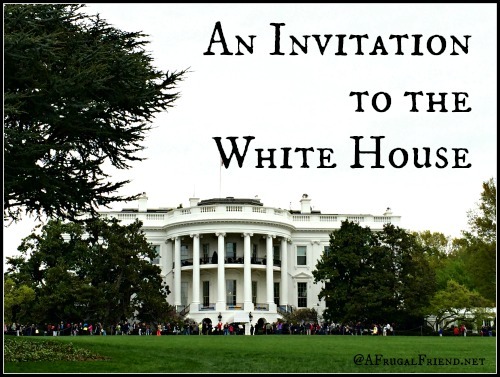 I’m sure it all starts with the entrance. Ever since my little girl was old enough to walk, she would march right up to the lobster tank, just inside the entrance, and say hello to all the lobsters. If she gets to pick the restaurant, though now she’s a much more selective tween, she always chooses Red Lobster. 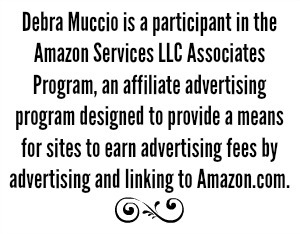 This mama is grateful, after all, who can be upset when cheddar biscuits and crab are in your future? There’s nothing quite like Red Lobster cheddar biscuits straight from the oven. I know my waiter loves me when they are served warm! It’s like dessert to me! And though I could fill up on cheddar biscuits and the garden salad, this time of year I had to save some room. 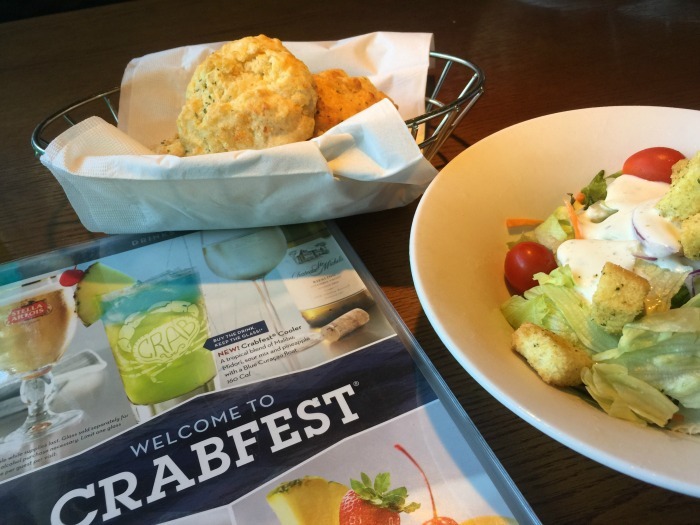 It’s Crabfest at Red Lobster (back for a limited time)! During Crabfest you’ll find the largest variety of crab dishes all year (oh, there are so many to choose from). For extra enjoyment, Red Lobster also adds new and unique items to the menu that aren’t entrees. This year they’ve added one appetizer and one refreshing summer drink (that happens to be served in the cutest Coastal Crab glassware – yes, you get to take it home with you)! You’ll want to order the brand new Three-Cheese Crab Dip, creamy blend of crabmeat and three cheeses (cream cheese, mozzarella, and Monterey Jack), served warm with artisan bread. 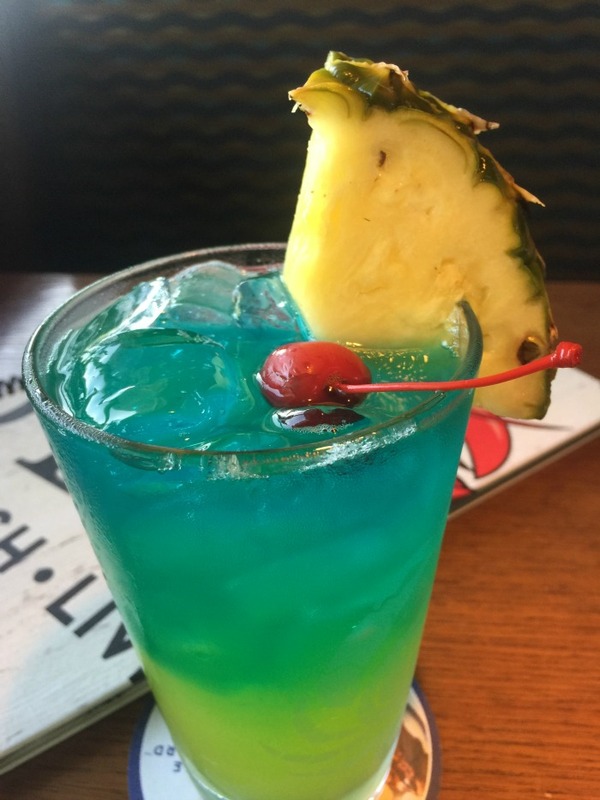 For the adults in your party, consider the brand new Crabfest® Cooler, with a tropical blend of Malibu®, Midori, Sour Mix and pineapple with a Blue Curacao Float. While I don’t drink alcohol very much, I made an exception for this and was not disappointed. The perfect summer drink! With so many crab entrees during Crabfest, it’s a little difficult to choose just one. This year there are five brand new dishes and four classic crab ones that guests love. I pondered and pondered and finally decided on the Shrimp-Topped Crab Cake Dinner. 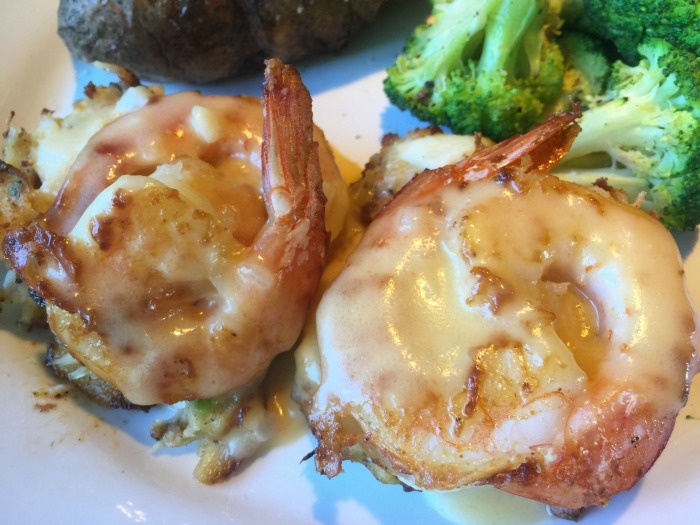 This dish features two shrimp-topped premium crab cakes with a white-wine and butter sauce. As with most entrees, mine was served with 2 sides…mine included a baked potato and broccoli. 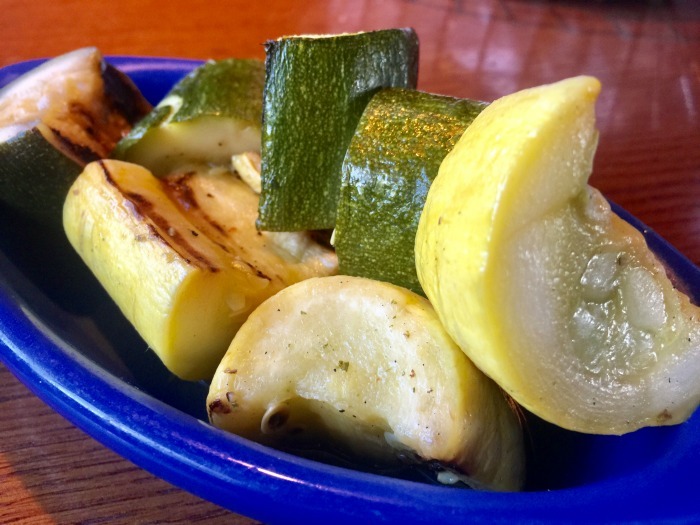 I was really craving vegetables though, so a side order of zucchini and yellow squash was brought to the table, thanks to our waiter Fred. I love yellow squash in summertime! Whether it’s king crab sourced from the icy waters of Alaska, Dungeness crab from the cold waters of the Pacific Ocean, or blue crab from the Atlantic Coast of North America, all of the crab served at Red Lobster is traceable to the source. Learn more about the sea-to-table journey of Red Lobster’s Alaska crab. Southern King Crab: Southern King Crab, found primarily off the Pacific Coast of South America, features a mild flavor and delicate texture. Dungeness Crab: Dungeness Crab is caught from the cold waters of the Pacific Ocean off the coast of North America, boasting a salty and sweet flavor, with stronger flavors in the claw and leg meat. Alaska King Crab: This is the largest of Alaska’s three crab species, prized for its leg meat, rich flavor and tender texture. Blue Crab: Blue Crab, most commonly used for crab cakes, is found along the Atlantic Coast of North America and features a sweet flavor and softer texture. Did you know there was that many types of crab? 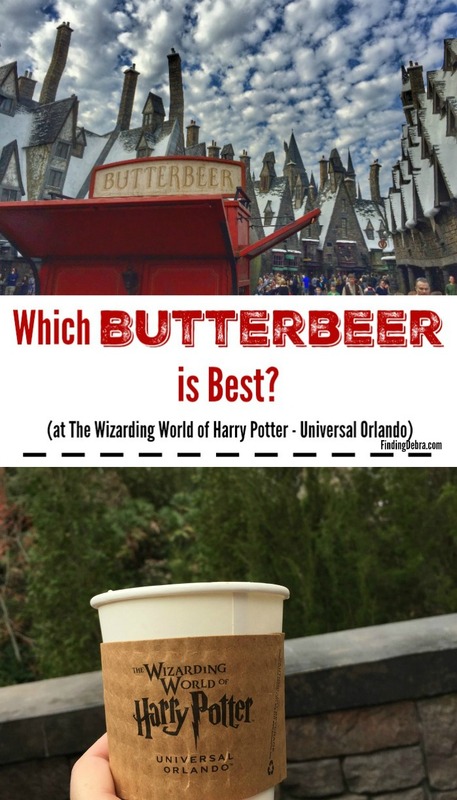 I’ll admit I had no clue! Though I may not be sure of what type of crab I’m eating, I pay attention most to the taste! These shrimp-topped crab cakes were the ideal size, perfectly breaded, and oh, the sauce was divine! I’m a sauce person! You know that I didn’t go to Red Lobster by myself, right? A certain little girl (who’s not so little anymore, come to think of it), joined me. 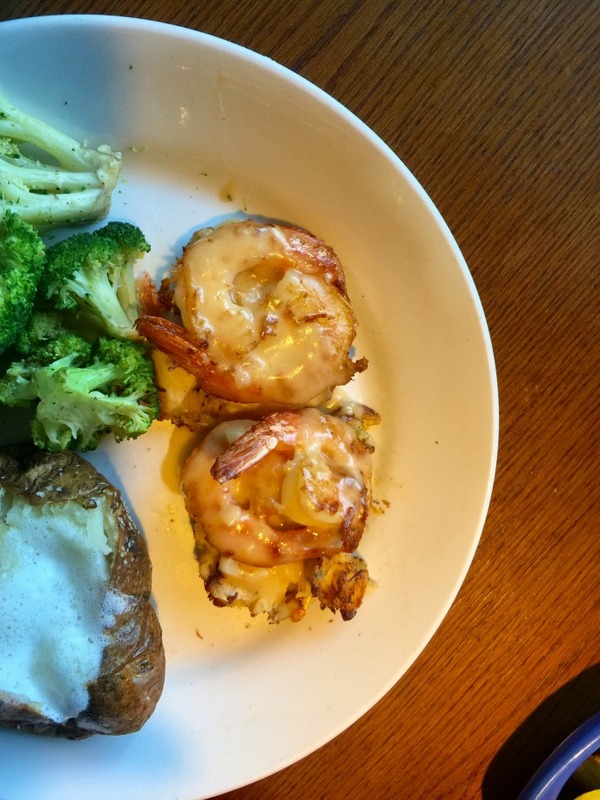 Her meal…the kids garlic grilled shrimp! Mmmmm! It’s almost the end of summer and I try to have special lunches with this one right here. We talk about the upcoming school year. 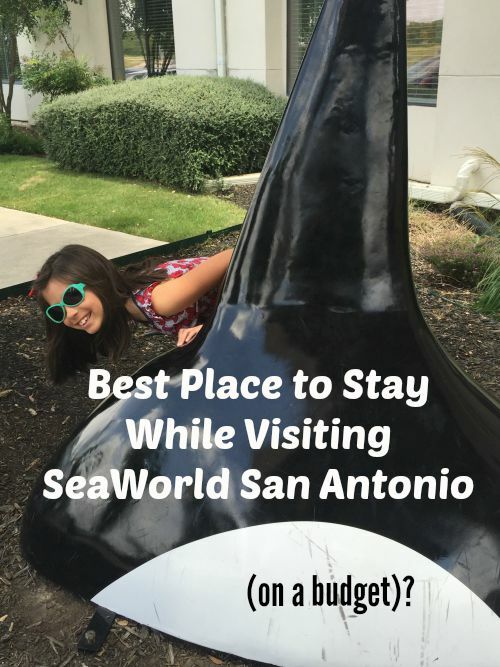 We reminisce about the adventures we’ve taken over the summer. Most of all, we just enjoy each other. These years go by all too quickly and I want to savor every moment. How do I know? Well, we just might be celebrating a big double-digit birthday. Her first. Time, please slow down! 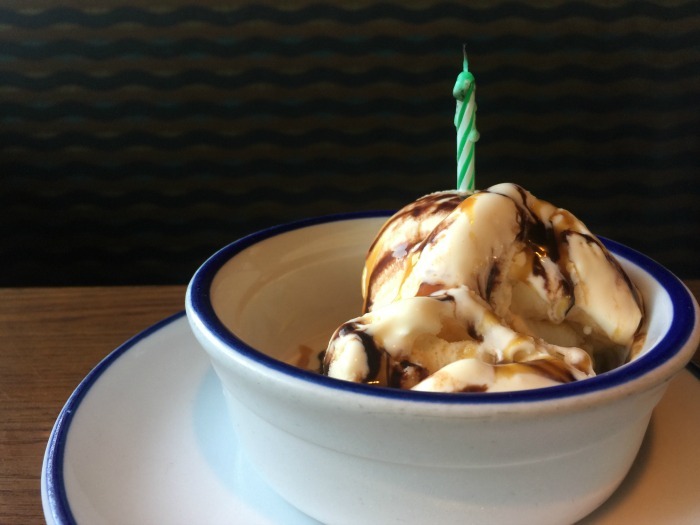 Our waiter, Fred, was so helpful and placed this candle on her birthday sundae. We all had a good laugh though because the candle wouldn’t stay lit. 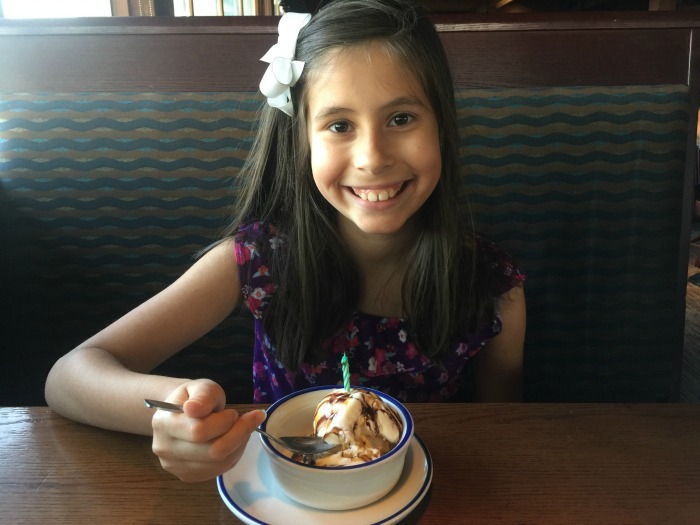 No, it wasn’t a trick candle to keep her 9 years old forever. 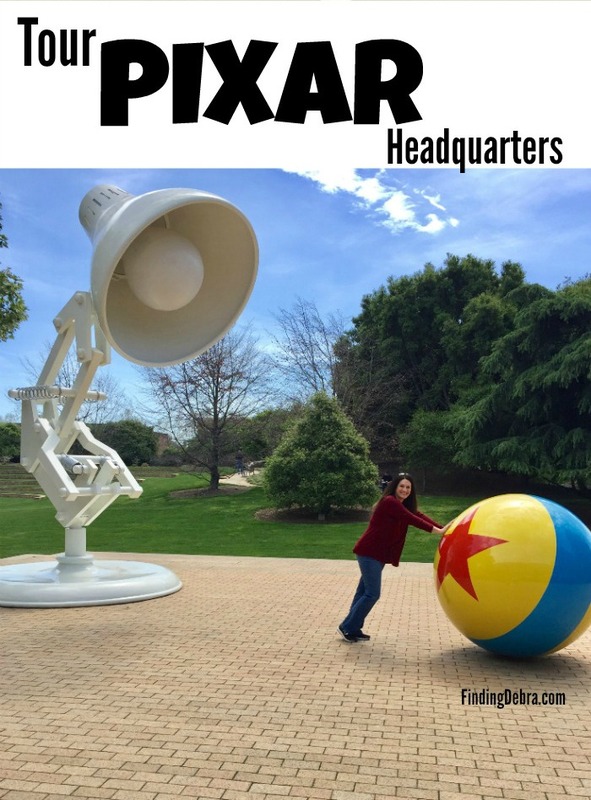 It was just the placement of the air conditioning – Ha! Red Lobster, thank you for the memories (and we’ve had so many family ones right here)! 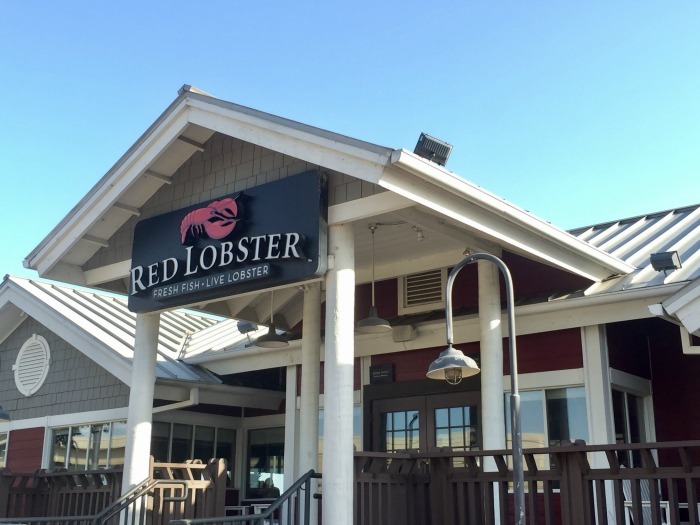 Don’t forget to stop by during Crabfest and check out all the Red Lobster specials. My dad LOVES Red Lobster! We take him any chance we get. Happy birthday to your not so little girl! Oh the precious memory your made over delicious food! Those are the best… good company, good food and Red Lobster! Happy Birthday to the tween! !